The Society had sponsored 10 drama students from around the UK to attend and to participate in a Masterclass, led by Ian Flintoff. Left to right. 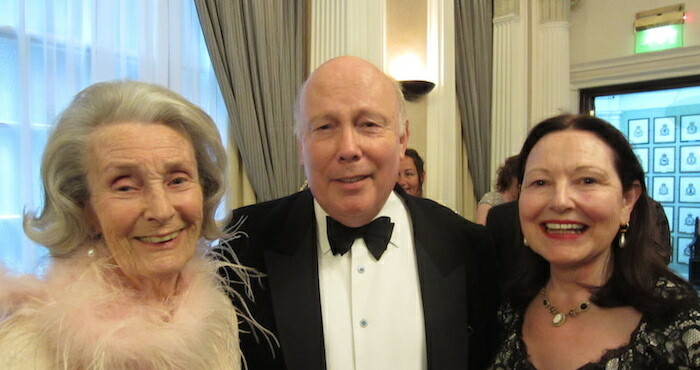 Julian Fellowes (Final Judge) Dan Rebellato (Final Judge) Roy Kendall (Award winning playwright) Barbara Longford (Chairman) Michael Darlow (Vice President). 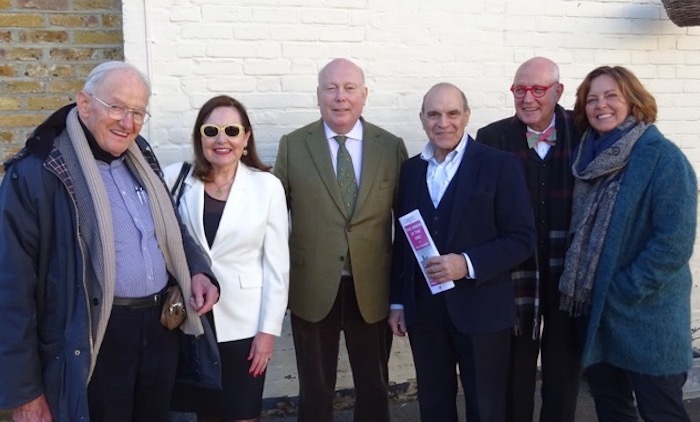 From Left to Right they are:- Michael Darlow, Vice President; Barbara Longford, Chairman; Julian Fellowes, Vice President; David Suchet, President; Geoffrey Wansell, Vice President; Greta Scacchi, Vice President. 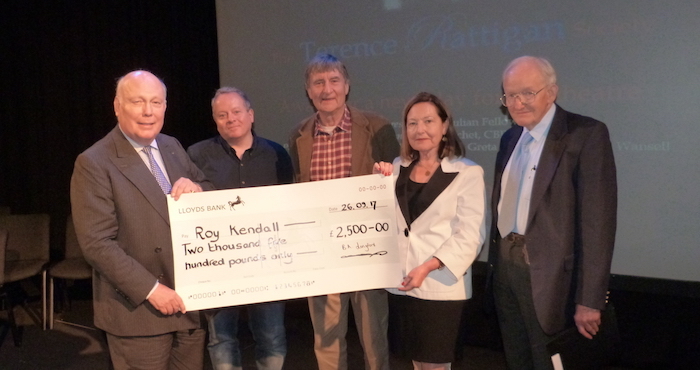 The Society’s Harold & Pegs French Award is aimed at bringing Rattigan’s work to a younger generation of actors and production staff by making a financial award each year to a drama schools mounting a Rattigan play. If proof were needed that the idea was a great one it came in the first award recipient Royal Central School’s version of Flare Path which had a successful run at the Embassy Theatre in Swiss Cottage recently. 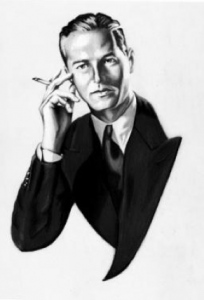 Not only were the production’s costs part funded; the society also produced a special booklet giving biographical details and articles about Terence Rattigan’s RAF career and linked writing which was given free to every audience member at each performance. Technical advice was given by our Secretary Group Captain Clive Montellier. Over forty five society members attended a special Gala Afternoon celebrating the event which included a buffet lunch and a question and answer session mounted for members of the Society after the Saturday matinee. Directed by Lindsay Posner the young cast gave a superlative performance of this wartime play made even more poignant by the fact that they were around the same age as the aircrew and families portrayed. And in it was clear from the post-show Q&A that the whole process had been a profound learning experience for everyone both sides of the curtain. In particular the cast stressed the continuing relevance of what might to some eyes seem a period piece while expressing delight at the sheer actability of the script. This was another in the series of regular Rattigan linked functions Society members can enjoy. While those who could not attend on the day will read a full account and review of the production in the next quarterly newsletter The Rattigan Version. If you’re not a member why not join us? The annual subscription is modest, the benefits enjoyable and you’ll also have the knowledge that you’re part of a growing body of people aiming to put perhaps the UK’s greatest twentieth century playwright back where he belongs. At the heart of things. 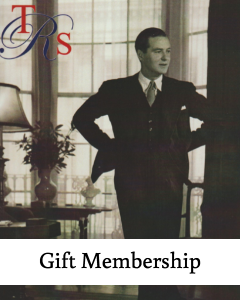 The Terence Rattigan Society was founded in Sir Terence Rattigan’s centenary year, 2011, to celebrate, enjoy and study the work and life of one of the Twentieth Century’s greatest playwrights. A prolific and successful author of plays and film scripts, Terence Rattigan’s most celebrated works include ‘French Without Tears’, ‘The Winslow Boy’, ‘The Browning Version’, ‘The Deep Blue Sea’, and ‘Separate Tables’. A regular printed copy of the dedicated magazine, with articles by leading playwrights, biographers and critics, as well as theatre listings and news and views. 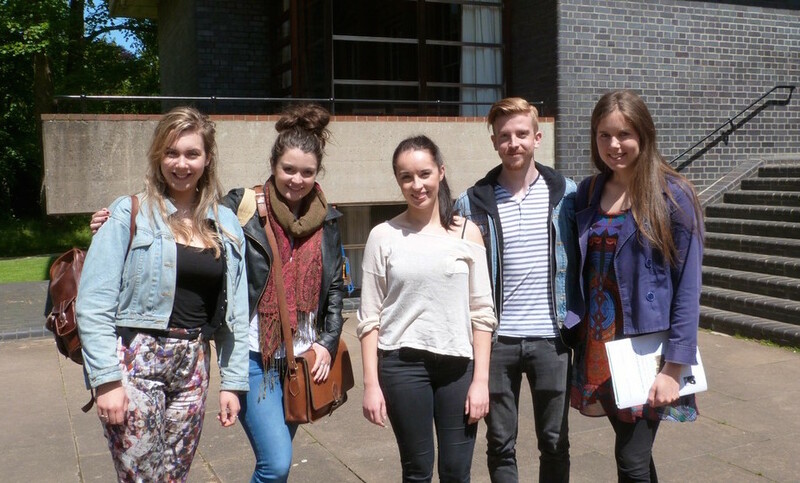 Visits to the leading drama schools for Rattigan productions, by talented young students. Masterclasses for students both young and mature, arranged in cooperation with the drama schools. 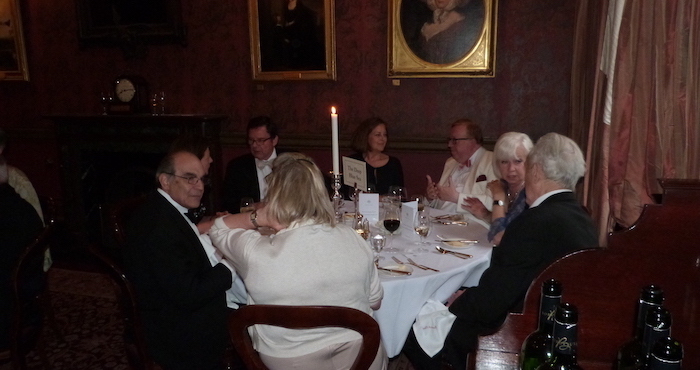 Theatre visits at discount prices, with optional suppers and an opportunity to meet like-minded people. Discussions with cast members and directors. Opportunities to visit Rattigan’s home at Albany and his birthplace in Cornwall Gardens. 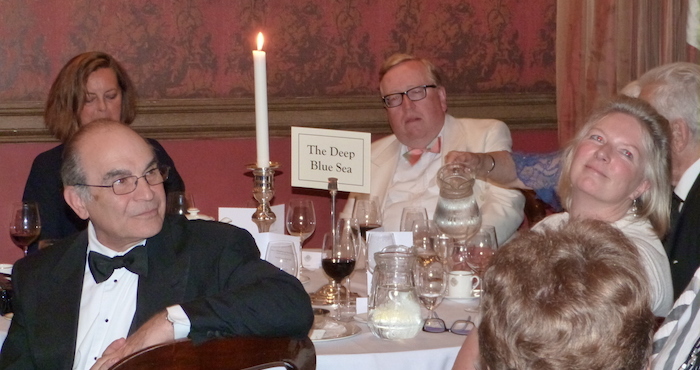 Events at The Garrick Club, courtesy of its historian, Geoffrey Wansell. Opportunities to attend events at Rattigan’s former school, Harrow and to explore their Rattigan archive. Opportunities to visit RAF sites with a Rattigan resonance, with film screenings and supper. Walking tours of areas where Rattigan lived and worked. 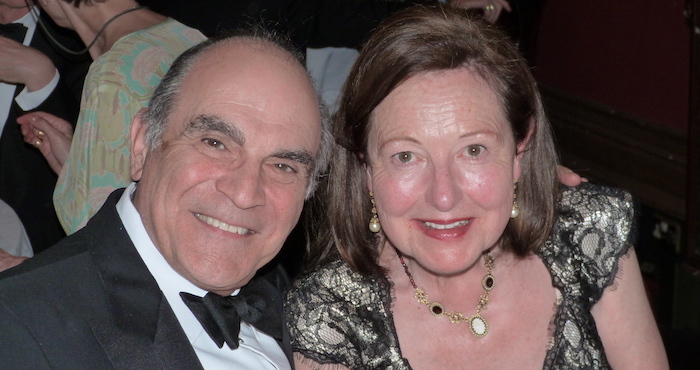 The Society was founded in 2011 with the support and approval of The Sir Terence Rattigan Charitable Trust and also of his biographers, Michael Darlow and Geoffrey Wansell. Last modified on 2018-08-07 17:51:01 GMT. 0 comments. Top.